Araby's father is a murderer, incidentally or not. She's on the run, fleeing the city that now sits in ruins, on board Kent's airship, the Red Death plague being unleashed. With both Prospero and Malcontent's men wanting to end Elliott's and Araby's lives, realising that the young, handsome revolutionary can bring hope and change within the city, restoring what the two men have attempted to destroy to ruins. There is no choice, they need to return to the smoldering city. Araby is determined to find her father, she has unanswered questions. Their dying city surely isn't the work of the gentle man who loved his family more than life itself, who invented the masks that keep the citizens from contracting the deadly disease, Araby is desperately praying that the propaganda isn't true. She needs to know if he found the cure he was working on, after twin brother Finn contracted the plague. It won't help Finn, but April is slowly deteriorating, Araby can't lose the one person she's confided in, relied upon, after Finn died. Elliot begins to rally his makeshift troops, setting up base camp within the Debauchery district. Will joins them in the mission back to the flaming ruins, for one reason only, Araby. It would be easier for Araby to let go and succumb to Elliot's charm, standing by his side as a measure of support, but it seems that Elliot wants more than the fraudulent relationship he had proposed... But her traitorous heart still cares for Will. With Malcontent's men ordered to spread the virus intentionally, the worshiped figure is sending those infected out in droves. The city is no longer being cleansed, and plague riddled corpses line the streets. Araby needs to resort to finding Malcontent for the promised cure for April. Her illness is rapidly spreading and she has little time left, she didn't plan on being captured by Prince Prospero himself. Escorted to the castle where a thousand of the finest city citizens have been promised a night to remember, but the prince has plans to make Araby the entertainment for the evening. She may never have this chance to kill the prince and end the citizens suffering again, but when her dashing rescuer is captured, Araby will be forced to choose between the ones she holds dear to her heart. Dance of the red death is seen through the eyes of Araby yet again, from the frightened girl who watched her brother die, to the brave young woman who has the power to forge forward with a revolution and bring the city back to a safe harbor without death and disease. 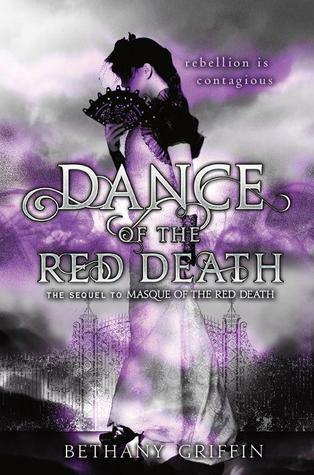 With it's dramatic and opulent surroundings and costumes, Dance Of The Red Death transports you to a dystopian world, an apocalyptic event, but with the charm and demeanor of a historic era. Beautifully written and mesmerising, it details the aspects of the new plague, and the dynamics of the characters. Entertaining, and the series seems to have come to an end, with only two books in the series sadly.